The Desh Ka Smartphone Is Here! It Is The Redmi 5A! Xiaomi is currently on a roll with quite a few smartphone releases in the past few months. Xiaomi is currently on a roll with quite a few smartphone releases in the past few months. From the innovative Mi Mix 2 to the affordable selfie series, the Y series, Xiaomi has it all. All the recent Xiaomi smartphones offer the best value for money with rich features at affordable prices. 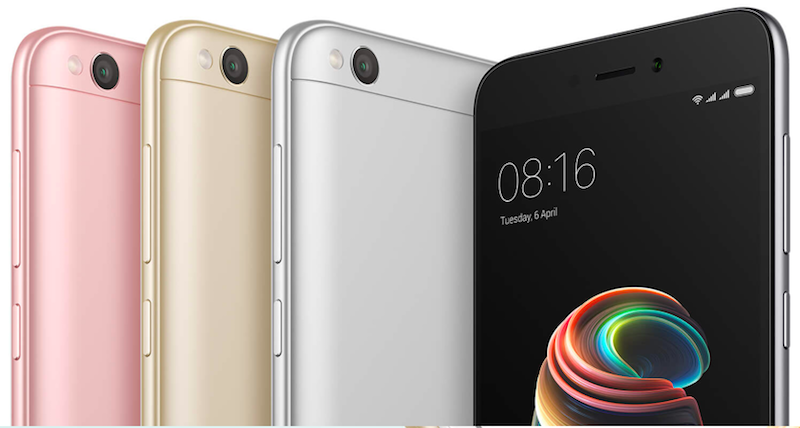 After teasing for the past few days, Xiaomi today released the ‘Desh Ka Smartphone’. And after much guesswork and speculations it has turned out to be the Redmi 5A! With Prices starting at Rs. 4,999/- for the 2GB + 16GB version, a 3,000mAh battery and a 13.0-megapixel camera, the Redmi 5A is poised to take on the mantle of the Desk Ka Smartphone. Let us take a closer look at this latest offering from Xiaomi. The Redmi 5A is the successor to the successful Redmi 4A and will be available with a very-affordable price tag. The Redmi 5A will feature a plastic body with a compact build. The build quality is on par with its pricing. It has gentle curves on the edges. The fingerprint sensor is missing in action. The Redmi 5A will be equipped with a 5 inch HD IPS display with a 720p screen resolution. The device will be powered by a 1.4GHz quad-core Qualcomm Snapdragon 425 processor. The chipset will be paired with an Adreno 308 GPU and 2GB or 3GB of RAM. The device will run MIUI 9 based on Android Nougat 7.1, out of the box. The smartphone will be available with two storage options, 16GB and 32GB. Storage can be further expanded up to 128GB with an external memory card. The Redmi 5A will sport a 13 megapixel primary camera, with an f/2.2 aperture. It will feature Phase Detection Autofocus (PDAF) with an LED flash. At the front, there will be a 5 megapixel selfie-shooter. The device will come with dual-SIM support and will support all major 4G LTE bands with 4G VoLTE connectivity. It has all the requisite sensors on board. The device will be powered by a 3,000mAh non-removable battery, which claims to offer up to a whopping 8 days of stand-by time on a single charge. Redmi 5A will be available at a starting price of Rs. 4,999/- for the 2GB + 16GB variant. The other version, 3GB + 32GB variant will be available at Rs 6,999/-. It is worth noting that the Rs. 4,999/- price is an offer limited to the first 50 lakh units only. Once that is over, the price will go up to Rs. 5,999/-. The Redmi 5A will be available in three color variants – Dark Grey, Gold and Rose Gold. Redmi 5A will be available online via Flipkart and Mi.com. It will be available offline via Xiaomi retail partners and Mi Home stores from December 7. The Redmi 5A is aimed towards the masses. With its specifications and features, it offers more than the other smartphones available in the market currently. It definitely has the potential to be successful as the Desh ka Smartphone with its affordable price tag. "The Desh Ka Smartphone Is Here! It Is The Redmi 5A! ", 5 out of 5 based on 2 ratings. Google Brings ‘Datally’ To Manage Your Mobile Data! Indian Economy Picks Up Pace With A 6.5% Growth; GST & Demonetization Blues Wear Off! Samsung ka jagah par aane ke liye kuch bhi karga. Jo sahi kar raha hai.